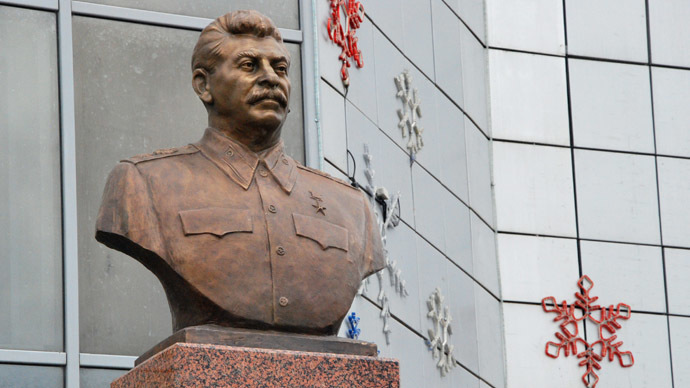 The NGO Memorial, which specializes in documenting the history of the Stalinist purges, has sharply criticized a proposal to erect a monument to Josef Stalin in Moscow and to rename the city of Volgograd as Stalingrad. “The public immortalizing of Stalin would be perceived by everyone as a confirmation of the positive attitude towards this man by Russia’s state and common people. This is impossible,” Memorial director Arseniy Roginskiy told reporters on Wednesday. The comments came as earlier this month a group of Communist Party MPs announced that they had have prepared an address to Russian President Vladimir Putin requesting that the city of Volgograd be renamed as Stalingrad, and that Stalin’s name and a monument be given to a square in Moscow. The head of the NGO expressed an equally negative attitude to the suggestion to include Stalin’s statue in the major memorial to heroes of WWII in Moscow, made by lawmakers from the parliamentary majority party, United Russia. “A monument is always some sort of positive appraisal of a person’s activities. This all looks quite strange. I suggest that we remember what the residents of the city of Novgorod did in 1862, when a monument to the millennium of Russian statehood was put up in this city. By a popular vote, Ivan the Terrible’s statue was removed from the monument’s plans and the central authorities supported this decision,” Roginskiy said. Russian Tsar Ivan IV (known as Ivan Grozny, or Ivan the Terrible, or Ivan the Awesome) was known, among other things, for the bloody campaign against Novgorod nobility whom he suspected of a pro-Polish conspiracy. “There were people who committed such crimes, who have passed such thresholds, that there is no opportunity to erect any monuments to them. They deprived themselves of the right of public immortalization. Stalin’s place is in museums and in history textbooks,” the head of Memorial told the press. The controversy surrounding Stalin’s name and his role in Russian history has been frequently used by various political forces in Russia in recent years. The argument reached its peak in 2013, when the country celebrated the 70th anniversary of the Battle of Stalingrad. Then various leftist forces proposed renaming the city of Volgograd to Stalingrad again, claiming that this was the name used by the city’s defenders during the war and claiming that Stalingrad was a better known word around the world. However, both the general public and the Russian officials rejected the idea. Polls showed that 60 percent of Russians were against the renaming and Putin’s press secretary, Dmitry Peskov, said in a press interview that Kremlin officials had never considered renaming Volgograd to Stalingrad and did not plan to put this issue on the agenda in the future. Originally named Tsaritsyn, the city was renamed Stalingrad in 1925 and had its name changed again, to Volgograd, in 1961.